To be honest, I just started taking these photos as a way to annoy my friends on Facebook. Now it’s turned into a bit of a quest to find the perfect office, that rare combination of beautiful surroundings, usability, and internet access. Here are my six favorite ‘offices’ so far. Pros: Amazing view, with cool sand to dig your toes into as you work, mango lassis or cold beer available. Pros: Power and wifi available, cheap beer, waves quietly lapping the shore just beneath your feet. Cons: Glare on laptop screen, annoying Trance music blaring in the background, strong smell of patchouli, no cheap tickets here — requires a bus/ferry/truck combo from Bangkok. Pros: Cold beer, power, wifi is only $1 per day, quiet and peaceful. Cons: Temptation to say ‘to Hell with it” and just go swimming in the river is hard to resist. 7 km out of town, so transport is needed. Pros: In the middle of nowhere, quiet, peaceful, owned by a friendly family. Pros: One of my favorite spots, real desk and chair, fast and free wifi, cool mountain breezes, incredible view. Cons: At the top of a steep hill, workers began noisily demolishing a building across the street on the third day. Pros: Great sunset views over the Mekong River, amazing food, cheap beer, very quiet. Cons: No wifi available, mosquitoes in the evening. 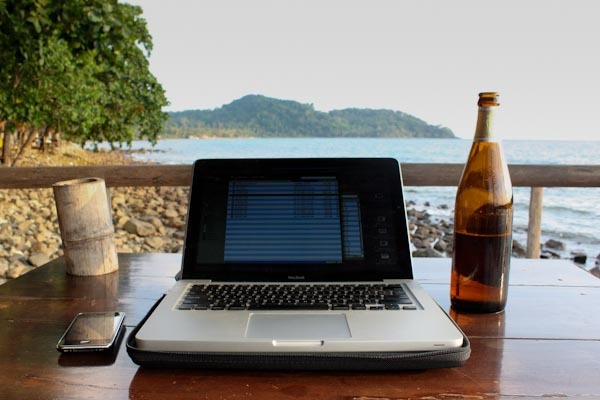 Where have you found your favorite work space while traveling? Four out of five cats agree, offices with a beer are preferential to offices without. .-= Laurence´s last blog ..Four amazing outback Australia film sets =-. .-= Evan´s last blog ..Sick! =-. I thought my villa veranda on a Greek island was pretty good but your spots with wifi have it beat. When I get around to it I will link to this post on my web site page about Work at home–at the beach — a collection of ideas to live and work abroad. .-= Michael´s last blog ..Use Olive Oil for better Genes =-. I love how you evaluate each working place with a gloat factor! So funny, but so true. Your first photo reminded me of our work situation at Haad Yao beach on Koh Pha Ngan. We had our first freelance writing/stock photography project and wifi wasn’t available so we worked in the bungalow cafe during the day and then hiked up the hill to the best internet cafe after dinner and spent hours uploading photos. Good times. .-= Audrey´s last blog ..Vietnamese Summer Rolls- Keeping the Taste of Summer Alive A Video Recipe =-. I had the same situation at Long Beach — there was one cafe with a slow connection on top of a hill. They turned the generator on at 6pm, so I’d work during the day, then race up the hill to post everything. Really makes you feel like you’re traveling, doesn’t it? I could definitely see myself doing this too, the boasting power surely out weighs anything else. .-= Cornelius Aesop´s last blog ..Things To Do in Japan in December =-. Wow those are amazing spots. They beat the crap out of my 15th floor coffee shop here in Korea, but I take what I can get. .-= Eric´s last blog ..10 Reasons to Pack Up and Move Abroad =-. That is awesome! I had a similar idea to do something like that but for my clients to see where I was working from. 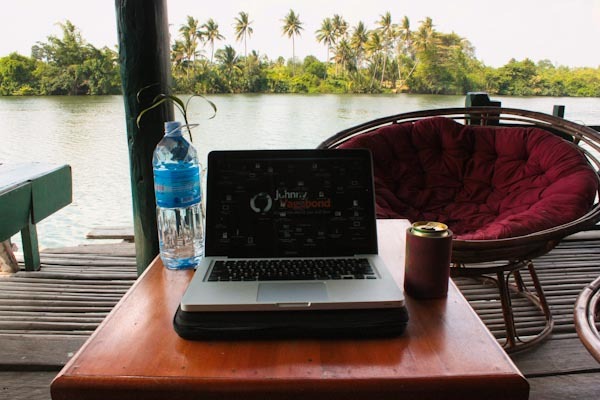 I want them to be involved and excited about what I’m doing and where I’m going… and not keep them in the dark about my Digital Nomad Location Independent status. I like how you rate each one on practicality and gloat factor. el oh el. Glad to see there are others out there like me!!! I leave in January for my indefinite trip around the world! .-= Jenny´s last blog ..The Dog Dilemma =-. Hope your trip planning goes smoothly! I’ve been thinking of doing that myself – take a photo every morning of my view so that people can have a better idea of what it’s like wherever I am. .-= Nancy´s last blog ..Women Wandering Solo- Elena Sevastiani =-. I love this! We are on a similar quest, but so far have not been able to find the perfect combination of views and wifi. We did manage to get lots done without internet though on Ilha Grande Brazil, and on a farm in Paraguay, but it’s not that practical all the time. .-= Erin´s last blog ..August Update- House Sitting &amp Stuck in Salta =-. Love your offices! I must say, one of my faves was working from my veranda on the Regent Navigator in the Mediterranean but internet not cheap. I also like to work right in my own back yard when my gardens are in bloom. I’ll keep following to see what other offices you find. Cheers! .-= Beverly´s last blog ..Sandals Resorts in St Lucia =-. Wow, this is frikkin awesome! That Vietnam view is absolutely gorgeous. Inspiration doesn’t get much better than that. Do you think it will be hard to transition to a single-location lifestyle, when your current RTW is over? .-= Casey Friday´s last blog ..Friday’s Kickass Question- What Are You Good At =-. Favorite work spot? This demolition job I scored across from a Hotel in Sapa, Vietnam. .-= Kevin´s last blog ..Different options for carrying fluids =-. .-= Earl´s last blog ..How To Get A Job On Board Cruise Ships =-. Haha great idea, love the photos! I never have much luck working outside in the sun though – no matter how I angle the screen, it’s too hard to read anything! Brilliant. Love the comments as well. Slightly jealous – beats the office I’m working out of in Queenstown but at least the views aren’t too far away! .-= Matt´s last blog ..The Gen Y Travel Blog Carnival- 3rd Edition =-. .-= G @ Operation Backpack Asia´s last blog ..g-and-ray-year-1 =-. Great post. Just what’s been on my mind recently as I plan a trip to Thailand and am wondering about how I’ll go with internet availability and unexpected distractions. Nice to have found your blog. Fun reading the comments too. .-= Jenny´s last blog ..Balm round-up 2 =-. Love the pics, love the tips, and love the angle. Nice post! Other than the beer, these are all pros/cons that had never occurred to me before, but I’ll be thinking about them soon. I did end up with the MBP and that booq case so…gonna have gloating pictures like this pretty soon. And by “like this” I only mean Thailand, not anywhere remotely near a beach. btw how is that my last blog entry? Weirdo app. .-= Jasmine´s last blog ..How To Get To The Termales De Santa Rosa =-. I think we stayed in the same hotel perhaps, awesome view. .-= SHABL´s last blog ..Egregrious Evening in Bangkok =-. I love that you have an alcoholic beverage in almost every photo. .-= Candice´s last blog ..A Newfoundland Language Lesson Part 3- Improperly Pluralise Everything =-. Hotel room in Sapa, Vietnam is a clear winner to me. Oh Johnny honey, been a while huh? If you’re photshopping you should at least include a cute gal draped over the computer, just like a car show. Remember those? .-= Nomadic Chick´s last blog ..Worst Washroom of the Week =-. I can’t wait to see the office that gets a 5 out of 5 score in both categories! I hope you’ll be hiring at that point. .-= Gareth Leonard´s last blog ..NEW PHOTOS- Salt- Rocks &amp Fun =-. .-= wanderingtrader´s last blog ..THE ROCKY BEACHES OF VALETTA- MALTA =-. .-= Theodora´s last blog ..Rafting the Maiting River =-. You put our own efforts at moving the office around to shame. Took our laptops (and oversized logo) downtown and sat in a cafe all day a while ago. The next beachfront is too far, we fear (cold, cold Iceland). .-= Johann Thorsson´s last blog ..Help us win… you know you want to =-. This is inspiring. I want a job like you have when I grow up. I look forward to seeing more posts like this. Anything beats our current office…Milwaukee, Wisconsin where we are counting down the days until we leave for our RTW trip 173 and counting! Plus we have our real jobs 50-70 hours a week and then coming home to plan this trip and build our website! It will all be worth it when we can enjoy all the offices around the world, like ones you captured, as we blog on our trip! 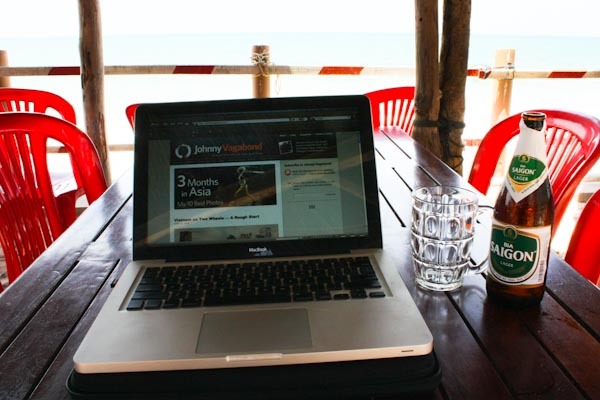 I would give anything for Koh Chang office right now! Get out there! Beer’s on me. This is adorable. I love the juxtaposition of serious commentary against envy-inducing bragging. 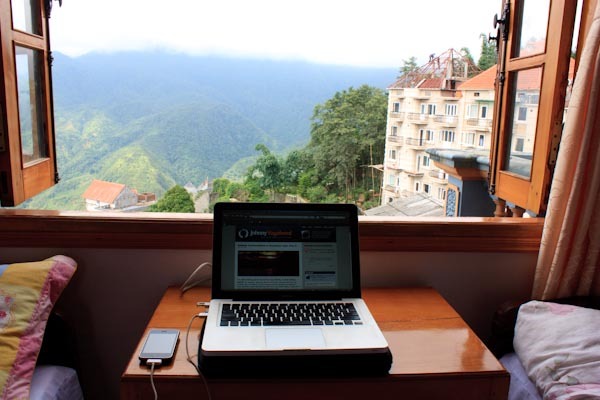 Man, that Sapa window view is killer. If you won’t have it, I’ll take it. Teehee. What Does a $4 Bungalow Look Like? rebecca: Awesome story! Felt so captivated! All Content ©2009-Present Johnny Vagabond Productions. JohnnyVagabond.com is proudly powered by WordPress and The Thesis Theme.